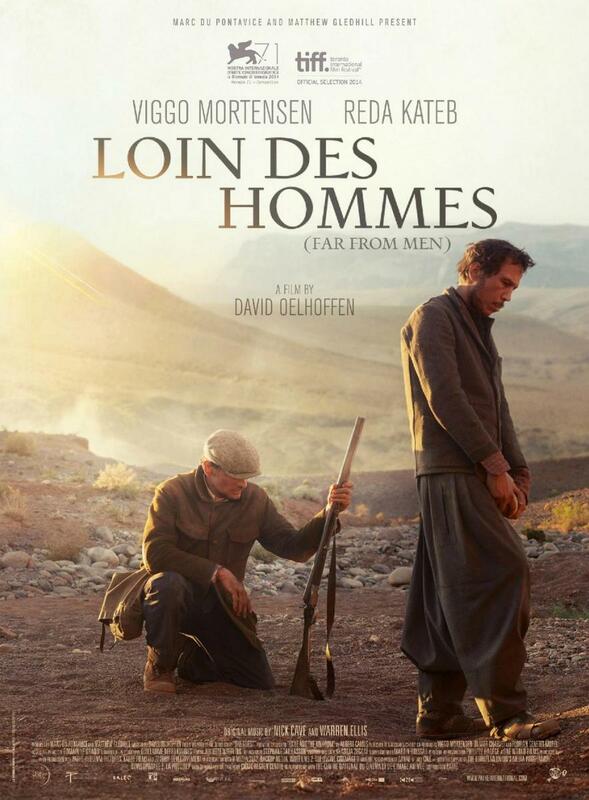 A French production about the Algerian War of Independence. Viggo Mortensen. Nick Cave and Warren Ellis handling the OST. That was easily enough to hook me into this film, and I wasn’t disappointed. Daru’s (Viggo) history is hidden in smoke when the movie starts, as he calmly teaches young children… About France, and French geography. So we know that he is involved with the settlement of the French in Algeria in some way, but something has caused his retreat to the Atlas mountains to teach. We aren’t told why, but it is made visually obvious by the extended, incredible panoramic shots of these mountains. His retreat to a peaceful life is shattered however, as he is handed a prisoner, a dissident against the French settlement who is to be escorted to a trial and, ultimately, execution. This hand-off occurs early in the movie, and throughout the journey makes for some emotional scenes as the two extremely different men slowly understand each other. Despite Daru’s protests, the prisoner Mohamed (Reda Kateb) has accepted his fate. Much to Daru’s angst then, they begin their journey. It seems like half the film is made up of distant, landscape shots, but considering the jaw-dropping beauty of them, I was staring mouth agape, my eyes scanning over the big screen to take it all in. They can’t help but be stared at. These shots aren’t simply of the mountains though – as the movie progresses we see similar shots, but in these we can just make out a track, and even smaller are the two journeymen who look like ants, even on a cinema screen. If that isn’t a visual metaphor for the exhaustive journey the two have in front of them, I don’t know what is. It also shows just how far away from home both men are – in completely different ways. They are in the same boat, trying to keep it from sinking, yet they on the surface they couldn’t be more different. Interestingly, despite the incredible photography of these views, only one colour is apparent until an important part of the narrative takes place, where we see the for the first time green scenery. The film’s concept certainly is nothing special: Two people making a long trek across dangerous territory, facing their own mortality, their values and beliefs. 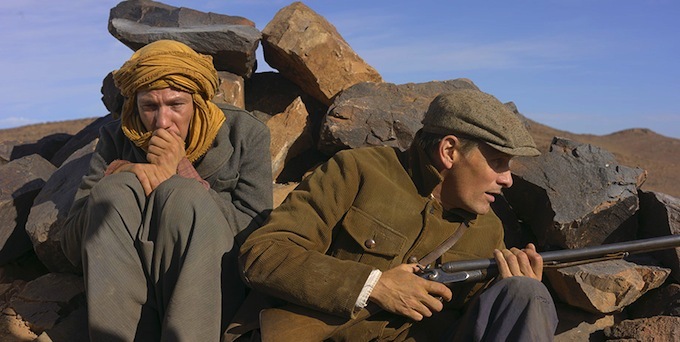 The film’s exploration of character gives it depth and humanity, while conversely the pair’s journey is filmed like a Western, with the raging war for independence providing a violent background to their struggles. Both men have stakes in this war, though again these are very different, and at first unclear. While very different men in many different ways, the one thing they do share, and the one motif that consistently rears its head is honour, and the different ways this value can be interpreted, both during war and otherwise. Themes like this dominate the film (and not in a bad way!) as the journey of the two men is an intimate study of selflessness, doing the right thing, respect, and loyalty. Politically speaking, this film is quite educational as I know very little of France’s involvement in Africa, and this film has prompted me to do a little reading myself. More obvious though is that, for the most part, this film could easily be transferred to one of many Middle-Eastern countries. Which is in many ways very unfortunate, as many people and countries are still fighting for individuality and freedom from oppression and war. There is no doubt that this story could easily be transplanted into a modern context. Unsurprisingly, Viggo is stellar in his role, speaking a slightly accented French to match his Algerian born character. If it were anyone but Viggo you could accuse him of showing off! But he does it so naturally and fits into the film’s world so well that you just can’t help but admire the guy. Reda Kateb, as the dissident/prisoner Mohamed, plays an apt and very somber role, which fits his character well. Both are essentially in every scene, but the film is far from boring, as not only do we gradually find out more about these two and their respective pasts, what they endure in the final act will have you on your toes. One last thing that was very noticeable to me was the sound-editing and mixing. The use of silence, sounds of harsh winds when appropriate and an ambient OST all combine to create an incredible atmosphere that had me leaning forward consistently. This combination creates a unique feeling of tension throughout, especially when the music slowly creeps up on you, letting you wonder where the long trek will lead both men. This effect of tension is heightened drastically when the story takes a sudden, sharp turn. I know I jumped out of my seat a couple of times, not due to anything surprising, but due to the incredible use of music to accompany the images on-screen. This is Cave and Ellis’ fifth effort at a soundtrack (I could be wrong on that number) and their second with Mortensen. Somehow I think they have a knack for this! With the most slight of alterations from the source short story by Albert Camus, combined with other texts he wrote about Algeria in the 30’s, director David Oefhoffen has created a seamless adaptation. By altering the year the story is based in, our narrative has the uprising of the Algerian people, ultimately leading to the Algerian War of Independence, slowly growing as a stark contrast to what the movie’s focus is, which is the developing relationship between Daru and Mohamed. The film certainly doesn’t go down the track one would expect from this type of film, which it must be praised for. It is a pity, then, that the last 20 minutes of this film feel so tacked on and separate from the tone set by the first 80 minutes. It almost felt as if they wanted to get past the 90-minute mark, where in reality this film would have been a lot better if it had ended at the 80 minute mark. This is the only major flaw that I could see, that and perhaps the unoriginal narrative. This is obviously a film for those who are fans of foreign films, art films, or Viggo Mortensen. I happen to be a fan of all three so I was very satisfied! Looks great, I remember seeing this trailer ages ago – am keen on anything with Mortensen. Nice review. I was also suprised that I was shoulder to shoulder in the cinema. Then the lights came down at the end and I was the youngest there by a good deacde or two ha! Mortensen as well. Colour me interested! If that is the case keep your eyes peeled as this one is fantastic. Comparable to The Road somewhat, The Rover too, a heavy focus on the human condition and therefore exploring the personality of the two characters and their relationship that they don’t have any choice in having. The background of a historical war makes it even more interesting. I hope you get to see it, I assume it’ll be released at some point, on BR at the very least, and if so I look forward to hearing your thoughts mate! Cool, thanks for passing this one along. I haven’t heard much of it either so I really appreciate the nod in its direction. Sounds like an interesting film.. As a fan of all that you listed there at the end also… 🙂 I am lucky enough to be going to see a screening of Jauja this coming Sat. with Viggo doing a Q & A afterwards.. I’m veeerrryy excited over this. Ohhhhhh I am so jealous of you!! That sounds like it will be an amazing time!!! Jauja is also a beautiful film, in a way. I’ve been meaning to write a review for ages but its been so long since it screened! I hope you enjoy it 🙂 I look forward to reading about it! I haven’t even heard of this but this sounds intriguing Jordan! 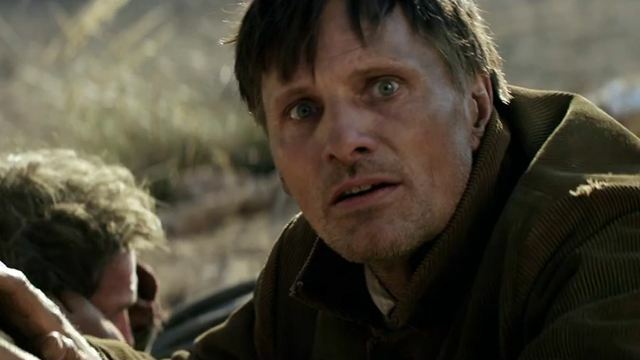 I also saw a Viggo Mortensen film this weekend, haven’t seen him in a while. Its a great story. The range Viggo has is just mental. What film did you see, Jauja? Oh, and yeah, Viggo is INDEED the MAN. The best actor around IMO. Jeez imagine if he decided to direct??! He is already a very good photographer…..
Cronie almost always delivers, and Cronie plus Viggo just has to equal awesomeness! I love those two films also, especially Eastern Promises. That bathroom/shower scene was mental. He certainly deserved the Oscar nomination! This sounds like exactly the sort of film I would enjoy… really need to try and catch it at some point. Nice review! Yeah one way or another I will hunt this one down!